Sale: Was £1095 now just £795! Monitor 12 pH probes. With digital I/O & counting. Expand to measure temperature, pressure, flow, level etc. The culmination of 30-years of experience designing data acquisition and control systems has resulted in this extremely versatile, compact unit which lets you monitor analogue transducers, digital sensors, utility meters, machines and digital status. It can also raise alarms and control digital outputs. 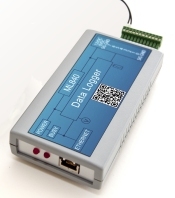 Data logger monitors 16 thermocouples or voltage signals, provides digital input and output, and frequncy and event counting. Communicates with PC over TCP/IP (eg Ethernet and Internet). We package Windmill with all our hardware. It comes with free technical support for life. We're sorry but we no longer offer Windmill as a stand-alone product. It is only available with data acquisition hardware. Truly Modular | Testimonials | Is Windmill Suitable for You? Each Windmill program concentrates on doing a single job and you simply run as many programs as you need. You can run several copies of each program, which means there are no fixed limits to the size of a Windmill system. 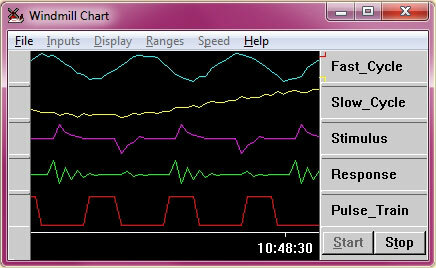 Windmill programs include logging, charting, process mimics, alarm logging, PID control and sequence control. You can also build specialised modules using a programming language like Visual Basic. Let Windmill take care of the hardware configuration and control, logging to disk, and so on. The finished system could use any of the hardware supported by Windmill. 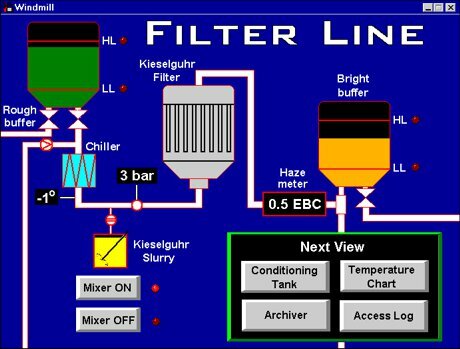 Create hmi windows with Windmill Graphics. This program customises the Windmill software suite, making a versatile system that is unique to your application. The window continuously reflects the state of the system in the real world. Once you've created a window you can protect it from further editing. You can make the display a simple front end, or show enough detail to keep the even the most data hungry happy. Virtual instruments, process mimics, annunciator panels, wiring diagrams... it's entirely up to you. To use Test Sequence you simply create a text file containing a list of commands, and tell Test Sequence to run it. The Help file supplied with Test Sequence gives loads of examples on how to perform tasks, and we are happy to help if your application isn't covered. As with the other Windmill programs, Test Sequence is packaged with all our hardware. "This seems like the best, most versatile, and professional data acquisition/processing suite I have seen.	" "Takes away the tedium of old fashioned data-logging and post processing by combining the two tasks into one. It is possible to run simultaneous measurement, computation and graphical analysis macros in Excel under the Windmill environment.	" Is Windmill Suitable for You? Supports an extensive range of equipment and communications protocols. Speeds up to a maximum of 200 samples per second with 20 or more channels, or with the Streamer module, 100000 samples per second. Alarm indication on all inputs. No programming required; all programs are ready to run. Transfer data to Excel or other applications. Free, lifetime, technical support when purchased directly from us.